Reviewz You Can Uze received these goodies free of charge from Chewy.com in an exchange for my honest opinion all opinions are 100 percent my own no financial compensation was received. I'm Always on the look out for new products for Bella, you never know what your cat might like and sometimes it's worth it to try something new. So this week chewy.com sent Bella a new treat and a different type of litter than we usually use and I must say it went well. I was totally surprised seeming that Bella is always so picky over everything. This week from chewy.com we got to try Purina Pro Plan Dental Crunch Cat Snacks with Natural Chicken and Liver Flavor Cat Treats Bella seemed to like this treat very well and to me any treat that supports your cats health and satisfy's the craving's is a win win, This treat is high in protein free from any artificial color, flavors, or preservatives this treat is also high in omega-6 fatty acid upping your cats maximum health benefits. Their crunchy texture helps keep your cats teeth clean, freshen breath, and removes tartar buildup this treat comes in a resealable bag to make your cats treats stay fresh longer and keep the flavor of chicken and liver stay rich in treat so your kitty will love every bit Bella really loved this treat we actually went out and bought her more of these treats after receiving this bag to review. 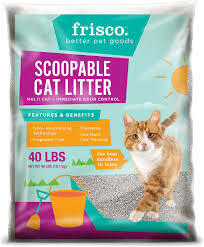 We also got the chance to review Frisco Multi- Cat Clumping Cat Litter 40 lb bag this litter is is made of all natural clay that form hard clumps for easy scooping. The granules create a powerful bond to lock in moisture and prevent any liquid from getting in the bottom of the litter box it's also especially formulated to help neutralize odor and is low tracking so that means less mess when your cat make it's way in and out of the litter box. This litter has a excellent order control we had never used this litter until this week I really liked this litter the way the litter clumps it makes cleaning the litter box a breeze the odor control works pretty good and this litter is very affordable really you cant bet it for the prize I think in the future we will purchase this litter again to use. Want to send a special thanks to chewy.com for all the love and hard work your company puts in to their products and for letting us get to review your products we really look forward to receiving your product each month.